Report information showing compliance with the specific requirements of the Plain Writing Act. For example, many departments submitted a URL for their Plain Writing webpage and training provided to their employees in the past year. Show plans for taking further steps to improve their agency’s writing. The agency’s “About Us” us page as linked from its homepage. A public facing document of their choosing. They also described the audience, purpose, context, and user testing of the samples. Having a webpage that describes the agency’s plain language efforts. Providing a feedback channel for people to report documents that are hard to understand and praise documents that are easy to understand. Responding to feedback in a timely manner (including our request for documents). 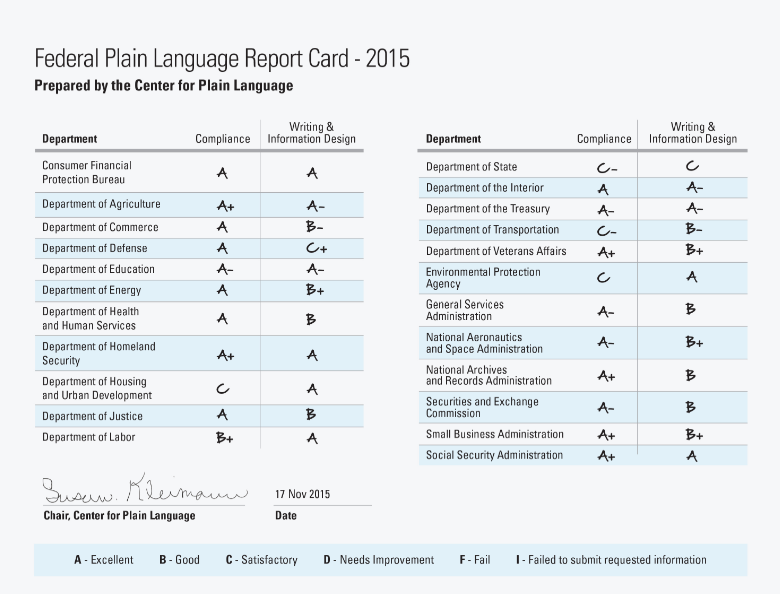 Having a link to the plain language webpage on their homepage or Open.gov. Submitting a report that explains how the agency complies with and implements the requirements of the Plain Language Act. Naming the plain language representative for each department. Training staff to write in plain language. Writing and Information Design — We reviewed writing samples to determine if they were easy to read, understand, and use. Does the document reflect an awareness of the intended audience? Does the document limit the use of passive voice? Does the writer use common words and avoid or define jargon? Is the content direct and concise, or does the document use more words than necessary? Does the typography vary (such as bold sub-headings or different fonts) to help readers organize and understand the content? Does whitespace (paragraph spacing, indentation) help reinforce the relationships among the main ideas? Does color draw emphasis and enhance important information? Do pictures, charts, or graphics reinforce what the words say? 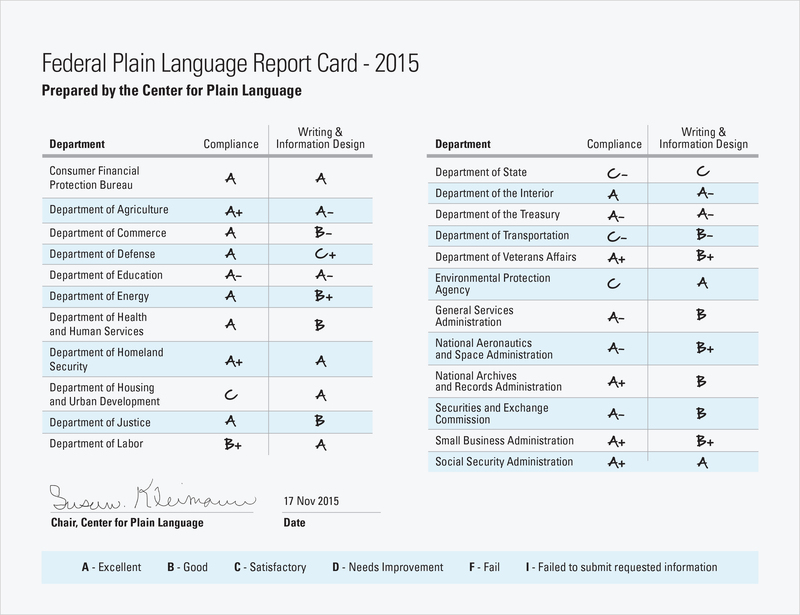 You can read more details about how we graded agencies in the full Report Card. Download and review the complete 2015 Report Card.